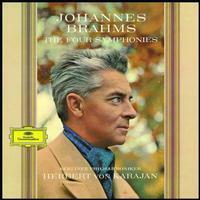 Karajan's first Brahms' Symphony cycle with The Berliner Philharmoniker (1959-1965) on Deutsche Grammophon. New remastering from original tapes with lacquers cut at Emil Berliner Studios. Limited, Numbered edition. 180-gram heavyweight pressings by Optimal. Twelve-page-booklet with original liner notes from Friedrich Herzfeld and Heinz Becker presenting an overview of Brahms' Symphonic Works and his Orchestral Palette.